Download "REPORT SPECIAL. States Act to Help People Laid Off from Small Firms: More Needs to Be Done. Highlights as of April 14, 2009"
1 REPORT April 2009 States Act to Help People Laid Off from Small Firms: More Needs to Be Done In the past two months, several states have taken action to make sure state residents who lose their jobs in small businesses can get the health coverage assistance offered them under the American Recovery and Reinvestment Act (ARRA), the economic stimulus legislation signed into law in February. ARRA included provisions to help laid-off workers keep their health insurance by making it more affordable for them to enroll in continuation coverage under the federal COBRA program or under state mini-cobra laws. This year, an estimated 7 million people who lost their jobs during the recession will have to pay only 35 percent of their COBRA health insurance premiums to maintain coverage; the federal government will pay the remaining 65 percent by providing tax credits to employers or health plans for up to nine months. This subsidy applies to people laid off from firms with 20 or more workers, who are eligible for federal COBRA benefits. It also applies to people laid off from firms with fewer than 20 workers if the state they live in has enacted a law guaranteeing their right to continue their health insurance benefits. These state laws are often called mini-cobra laws. 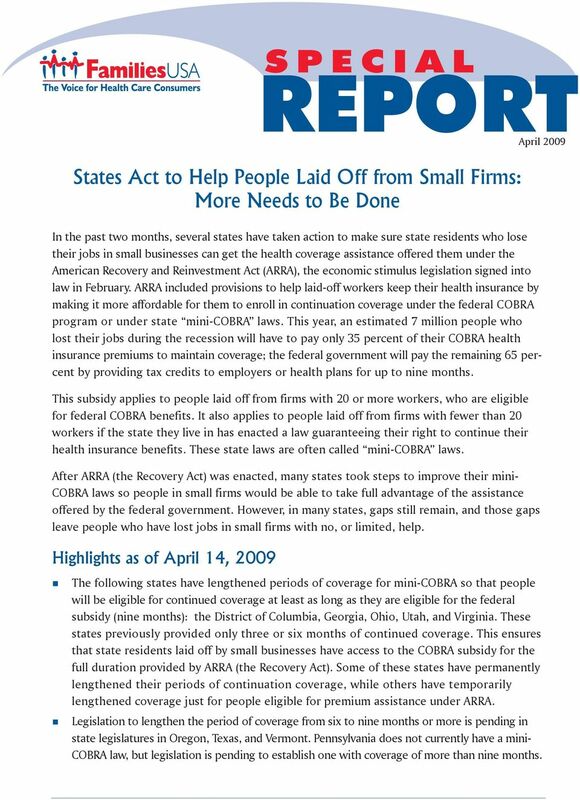 After ARRA (the Recovery Act) was enacted, many states took steps to improve their mini- COBRA laws so people in small firms would be able to take full advantage of the assistance offered by the federal government. However, in many states, gaps still remain, and those gaps leave people who have lost jobs in small firms with no, or limited, help. 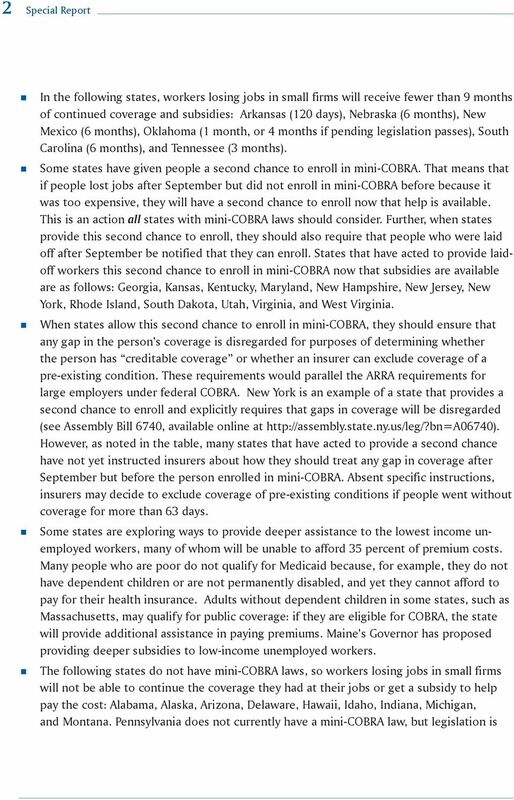 Highlights as of April 14, 2009 SPECIAL The following states have lengthened periods of coverage for mini-cobra so that people will be eligible for continued coverage at least as long as they are eligible for the federal subsidy (nine months): the District of Columbia, Georgia, Ohio, Utah, and Virginia. These states previously provided only three or six months of continued coverage. This ensures that state residents laid off by small businesses have access to the COBRA subsidy for the full duration provided by ARRA (the Recovery Act). 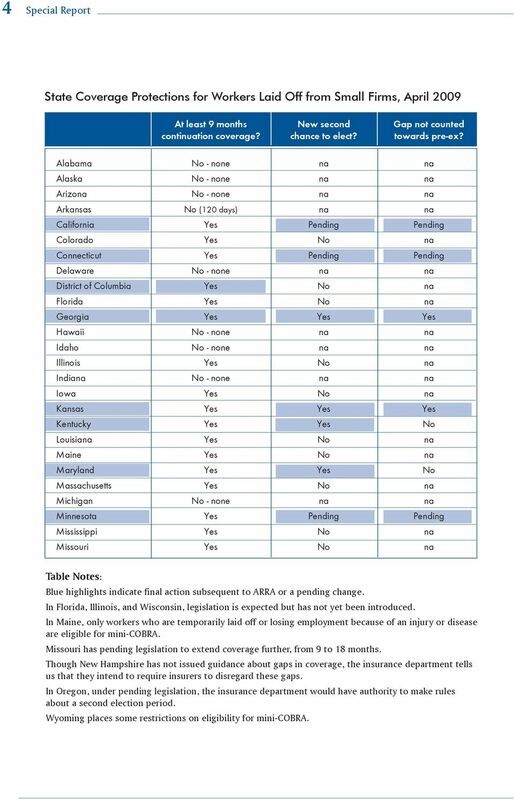 Some of these states have permanently lengthened their periods of continuation coverage, while others have temporarily lengthened coverage just for people eligible for premium assistance under ARRA. 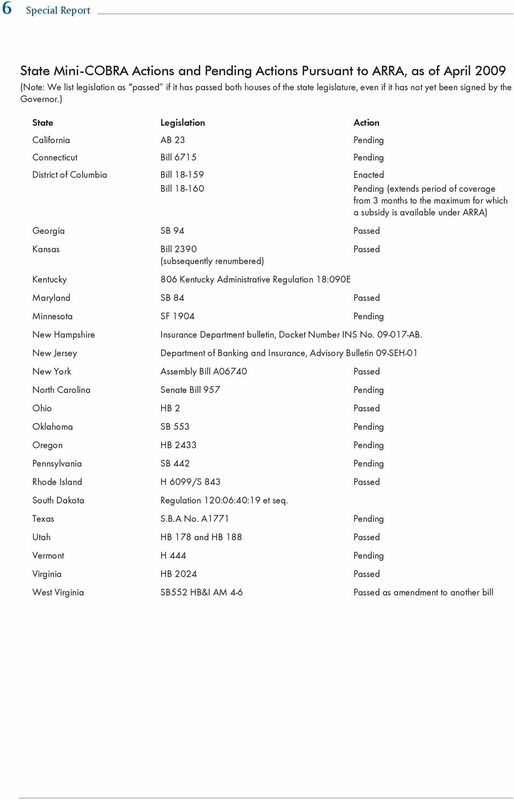 Legislation to lengthen the period of coverage from six to nine months or more is pending in state legislatures in Oregon, Texas, and Vermont. Pennsylvania does not currently have a mini- COBRA law, but legislation is pending to establish one with coverage of more than nine months. 4 4 Special Report State Coverage Protections for Workers Laid Off from Small Firms, April 2009 At least 9 months New second Gap not counted continuation coverage? chance to elect? towards pre-ex? Alabama No - none na na Alaska No - none na na Arizona No - none na na Arkansas No (120 days) na na California Yes Pending Pending Colorado Yes No na Connecticut Yes Pending Pending Delaware No - none na na District of Columbia Yes No na Florida Yes No na Georgia Yes Yes Yes Hawaii No - none na na Idaho No - none na na Illinois Yes No na Indiana No - none na na Iowa Yes No na Kansas Yes Yes Yes Kentucky Yes Yes No Louisiana Yes No na Maine Yes No na Maryland Yes Yes No Massachusetts Yes No na Michigan No - none na na Minnesota Yes Pending Pending Mississippi Yes No na Missouri Yes No na Table Notes: Blue highlights indicate final action subsequent to ARRA or a pending change. In Florida, Illinois, and Wisconsin, legislation is expected but has not yet been introduced. 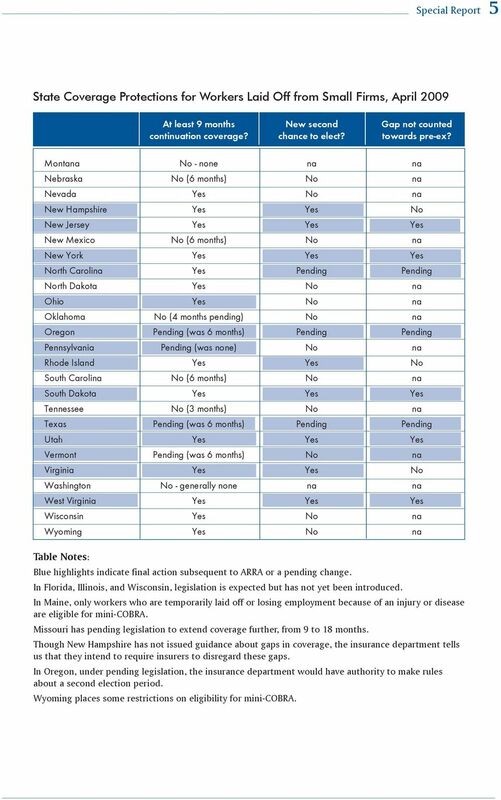 In Maine, only workers who are temporarily laid off or losing employment because of an injury or disease are eligible for mini-cobra. Missouri has pending legislation to extend coverage further, from 9 to 18 months. Though New Hampshire has not issued guidance about gaps in coverage, the insurance department tells us that they intend to require insurers to disregard these gaps. In Oregon, under pending legislation, the insurance department would have authority to make rules about a second election period. Wyoming places some restrictions on eligibility for mini-cobra. 5 Special Report 5 State Coverage Protections for Workers Laid Off from Small Firms, April 2009 At least 9 months New second Gap not counted continuation coverage? chance to elect? towards pre-ex? Montana No - none na na Nebraska No (6 months) No na Nevada Yes No na New Hampshire Yes Yes No New Jersey Yes Yes Yes New Mexico No (6 months) No na New York Yes Yes Yes North Carolina Yes Pending Pending North Dakota Yes No na Ohio Yes No na Oklahoma No (4 months pending) No na Oregon Pending (was 6 months) Pending Pending Pennsylvania Pending (was none) No na Rhode Island Yes Yes No South Carolina No (6 months) No na South Dakota Yes Yes Yes Tennessee No (3 months) No na Texas Pending (was 6 months) Pending Pending Utah Yes Yes Yes Vermont Pending (was 6 months) No na Virginia Yes Yes No Washington No - generally none na na West Virginia Yes Yes Yes Wisconsin Yes No na Wyoming Yes No na Table Notes: Blue highlights indicate final action subsequent to ARRA or a pending change. In Florida, Illinois, and Wisconsin, legislation is expected but has not yet been introduced. 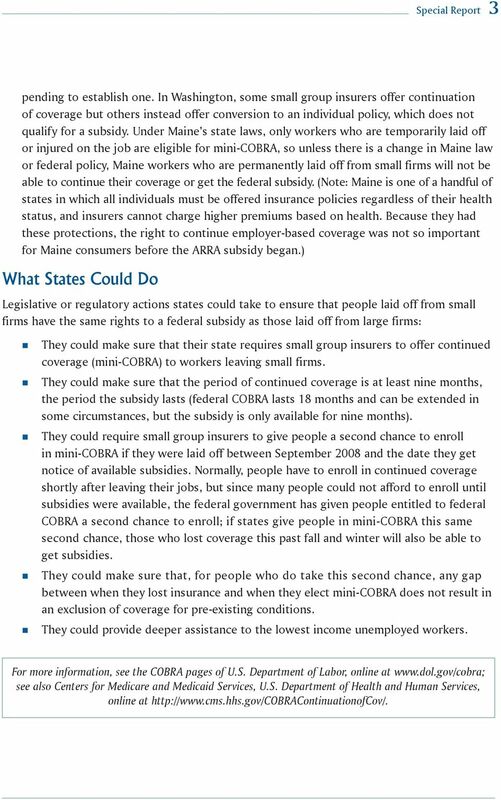 In Maine, only workers who are temporarily laid off or losing employment because of an injury or disease are eligible for mini-cobra. Missouri has pending legislation to extend coverage further, from 9 to 18 months. Though New Hampshire has not issued guidance about gaps in coverage, the insurance department tells us that they intend to require insurers to disregard these gaps. In Oregon, under pending legislation, the insurance department would have authority to make rules about a second election period. Wyoming places some restrictions on eligibility for mini-cobra. 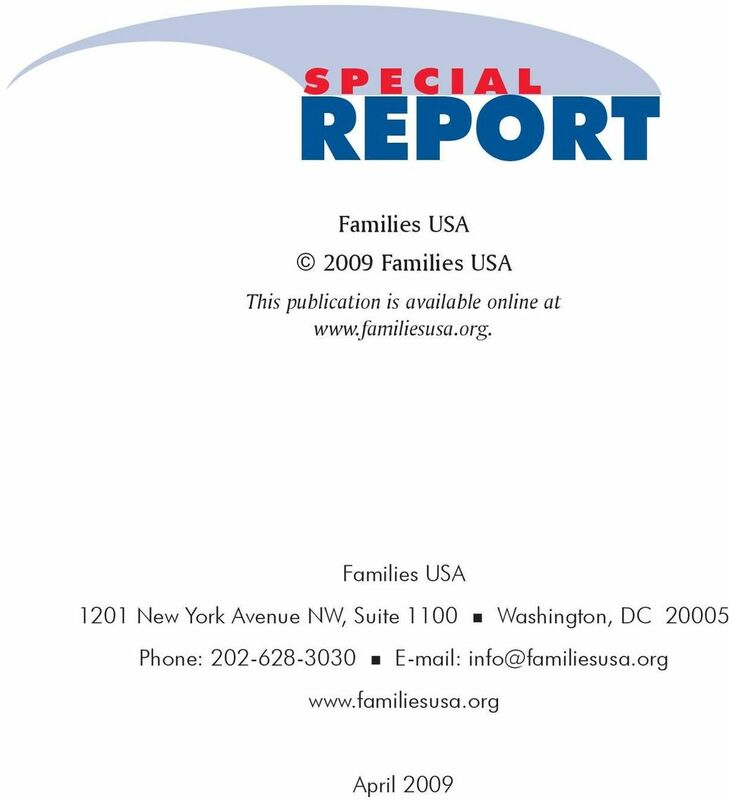 A PUBLICATION OF THE NATIONAL COUNCIL FOR ADOPTION. HEALTH INSURANCE FOR ADOPTED CHILDREN by Mark McDermott, J.D. with Elisa Rosman, Ph.D. Adoption Advocate NICOLE FICERE CALLAHAN, EDITOR CHUCK JOHNSON, EDITOR NO. 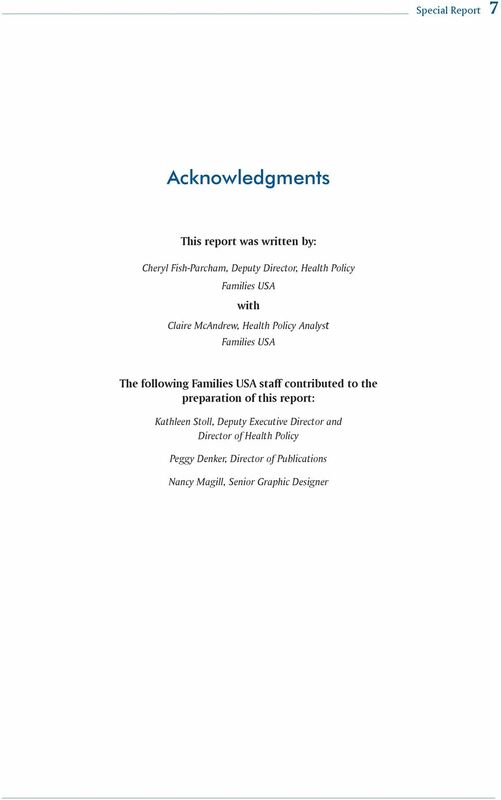 19 DECEMBER 2009 A PUBLICATION OF THE NATIONAL COUNCIL FOR ADOPTION HEALTH INSURANCE FOR ADOPTED CHILDREN by Mark McDermott, J.D.